(CNN) -- If Craig Blair gets his way, anyone filing for unemployment or food stamps must show that they are drug-free. He's a state lawmaker in West Virginia who has introduced a bill to require random drug testing for benefits and lays out his case on a Web site called notwithmytaxdollars.com. Craig Blair says unemployment, designed to get people back to work, is impossible if the recipient uses drugs. Blair and his supporters say drug use is rampant and taxpayers are growing alarmed with how the government is spending their money. "The message that we're trying to send is, first of all, we need to respect taxpayers and how their monies are spent," the Republican said. "And drug addiction is in epidemic proportions, and not only in West Virginia but throughout the United States." His bill would require random drug testing for any government assistance: welfare, jobless benefits or food stamps. Someone who failed the drug test would get the benefits and 60 days to clean up. If he failed the next test, he would lose benefits for two years. "It seems ironic that welfare and unemployment are both designed to get you back to work and everything, but how is that possible if you're on drugs?" Blair asked. Lawmakers in 10 states are considering some type of legislation to tie the expansion of safety-net spending to random drug testing. Similar measures in Michigan and Arizona have failed, either struck down by the courts or found to be too expensive. amFIX: Should people be drug tested before getting benefits? Graham Boyd, director of the American Civil Liberties Union's Drug Law Reform Project, calls it "typical political theater." He says the measures will be challenged in court and struck down. Random drug testing is costly, and he called such measures "cruel" during a recession. "If anything, [you'd think] people would be more compassionate now that people have lost jobs," Boyd said. But as the recession tightens its grip, momentum is growing in a handful of states to put strings on the vast expansion of safety-net spending. According to the National Conference of State Legislatures, 10 states (Florida, Arizona, Hawaii, California, Illinois, Iowa, Arkansas, West Virginia, Virginia and New York) are considering some form of legislation requiring random drug testing for food stamps, jobless checks and other state entitlements. It could affect millions of Americans who are turning to expanded benefits signed into law as part of the economic stimulus package. According to the Labor Department, a record 5.6 million people from all walks of life collect jobless checks, and the government says that almost 32 million now use food stamps. 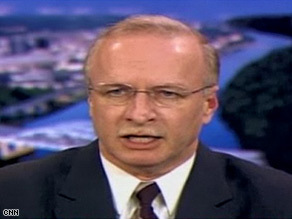 Ron Haskins of the centrist Brookings Institution takes issue with lumping jobless benefits with other state benefits. "Unemployment insurance really is not a welfare program. It's an insurance program, which means that they've paid into the program each month they've had earnings," Haskins said. "Unless we want to cancel insurance policies because someone doesn't pass a drug test, I think that's really quite a mistake." Critics also say that these measures don't address drug treatment, the costs of administering the tests or privacy concerns, and that they could prevent drug users from seeking benefits. But lawmaker Blair said he has been inundated with support for his bill and says epidemic drug use and a worsening economy means it's time for some "tough love." It's the intersection of several issues -- drug abuse, the recession and bailout overload -- and has generated passionate debate among CNN viewers. Angie: "If we're going to drug test American citizens who receive taxpayer-funded services, then I'm assuming these drug tests will be administered to the CEOs of AIG, Citi, Wells Fargo and Bank of America as well. Shouldn't the CEO, who receives trillions of taxpayer dollars, be held to the same standard of accountability as the unemployed?" Ron: "Monies would be better spent on cutting out the sources. The concerns over Mexico's drug cartels would be better invested than random screening of welfare recipients. ... Address the problems, not the symptoms." Bob: "I get more than a little disturbed when I read that unemployment benefits are considered by some right-wingers to be 'taxpayer-funded handouts.' Handouts? Really? Hmmmm. Seems to me that most people pay, oh, I don't know, unemployment taxes when they are working so they have a safety net if they lose their jobs." Albert: "Not unless they intend to offer rehab/recovery/counseling if applicants test positive. Will they be screening for alcoholism or gambling addiction? What about nicotine addiction?" Tami: "I'm in favor. I've also been drug tested for my job. A stipulation for receiving unemployment benefits is that you are actively seeking employment. A person can't be too serious about their job search if they are high." But Blair said, "You've got to keep in mind to that there is only a limited supply of money out here, and this is not going to hurt anybody that's not doing illicit or illegal drugs. And the fact is that if we can get this people off of the drugs and make it so they're work-ready, that will help us in West Virginia." CNN's Elise Zeiger contributed to this report.